Four Bands for a good cause! Hey everyone. Travis back with some Tampa Bay entertainment for a good cause. Rock by the Sea is a nonprofit organization that uses music and concerts to raise money to fight pediatric cancer. The event that is going to be held in Tampa will be on Wednesday, August 18 and will feature four bands and an art show of local artists, as well as a silent auction. The bands participating are Southside Serenade: local rock band, Hightide Blues: an indie rock band from Nashville, Dirty Shannon: an acoustic duo from Orlando, and Stephen Hunley: singer songwriter from Knoxville. All of the bands are incredibly talented and are traveling to make this event because they believe in the work that Rock by the Sea does. In the silent auction there will be music memorabilia including signed pictures, posters, cds, tickets, etc. from Zac Brown Band, Collective Soul, Will Hoge, Ingram Hill, and more. There will also be artwork donated by the artists that are featured in the art show. The event will begin at 6pm and will go until 11pm, or until the bands are done with their collective jam session at the end of the night. 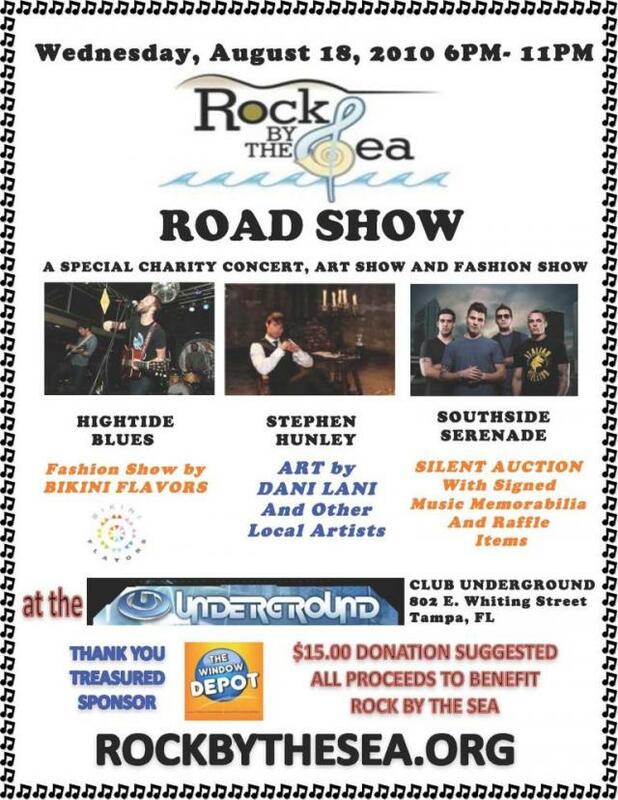 It will be held at Club Underground in downtown Tampa at 802 E. Whiting St. 33602. If you need more info, just head over to www.rockbythesea.org! And keep checking back here for more info about great things to do in Tampa Bay and other Tampa Bay area events.